Show your love this Valentine's. Show them that your love is meant to last. A mixed arrangement of fresh flowers of fragrant lilies, roses, carnations, and miniature carnations with greenery in a rosey pink glass vase. 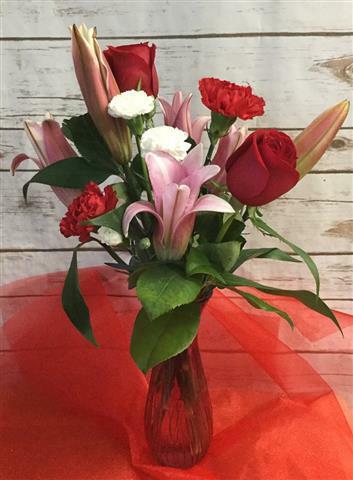 ADDS ANOTHER STEM OF EACH FLOWER WITH A SIMPLE BOW FOR $20.00 PLUS TAX.